The key to your progress is the relationship that is built between you and your coach, imagine having your coach with you every time you play and practice! Whenever you have a lesson, play or practice your progress is updated, your drills, videos and Stats are uploaded. MyGame is the life and soul of your game tracking your progress and helping you achieve your goals. You can access your previous lessons which include notes, videos and drills as well as keep up to date with what you need to practice. Be rewarded for progress - you can win and collect ‘Trophies’ for all sorts of achievements including completing programmes of various levels. Understand your game with ‘Shot Tracker’, a comprehensive statistics package integrated within the main platform. Build up your personal library of videos, photos and drills all relating to your game. Either you or your coach can add media and apply tags that enable you to quickly search and access specific content relating to your progress. 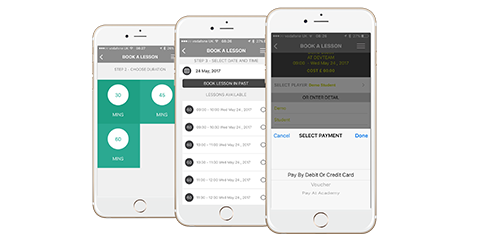 Our innovative ‘Online Booking’ makes it easy for you to book lessons and classes at the touch of a button. Whether you’re booking a One-to-One lesson directly into a coach’s calendar or simply booking a place on a group programme you can do this easily with our booking system. Book through your PC/Mac, tablet or even from the golf course using your dedicated App! Use the ‘Store’ to purchase specific packages, vouchers and other related merchandise.